"The epidural stimulation technology really helps me feel like I'm back to who I was before my injury." Following his injury, Kent was classified as both motor and sensory complete, so he was unable to move or feel below his injury level at T5 and T6. Researchers were uncertain if epidural stimulation would work, but Kent challenged their hypothesis - and recovered the same autonomic and motor functions as Rob Summers, the first study participant. "I was a Pro-Am Motocross racer. I hit a jump and my motor locked up. The accident left me paralyzed from the chest down when I was 21. The doctors told me it was a complete injury — basically that there was no hope for me to regain any mobility." "I was really active. In addition to the motocross, I was into a lot of outdoor stuff. A lot of those things I wasn't able to do after my injury, either because of physical limitations or just not having enough time between managing all of the complications of SCI." 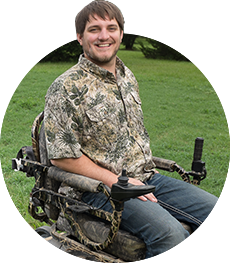 "I had tried to move my legs so many times — and then with the stimulator on, I was able to complete the movement. It was nuts. Being able to stand on my own is an amazing feeling. I can work out now and go hunting, fishing and trailing. I feel really good. Sometimes I forget I still have a wheelchair."